Last week, Walt Disney Animation Studios unveiled a new poster for Zootopia, which featured both of the main characters, rookie cop Judy Hopps (Ginnifer Goodwin) and con artist Nick Wilde (Jason Bateman). Today, the studio has released a new trailer, which showcases one of the stumbling blocks Judy runs into on her latest case: the Department of Mammal Vehicles (DMV), which is run entirely by sloths. Anyone who has spent time at the human DMV can relate to the agonizingly slow pace of this facility, as Nick introduces Judy to the "fastest" sloth at the DMV, Flash (voiced by Raymond S. Persi). The modern mammal metropolis of Zootopia is a city like no other. Comprised of habitat neighborhoods like ritzy Sahara Square and frigid Tundratown, it's a melting pot where animals from every environment live together-a place where no matter what you are, from the biggest elephant to the smallest shrew, you can be anything. But when rookie Officer Judy Hopps (voice of Ginnifer Goodwin) arrives, she discovers that being the first bunny on a police force of big, tough animals isn't so easy. Determined to prove herself, she jumps at the opportunity to crack a case, even if it means partnering with a fast-talking, scam-artist fox, Nick Wilde (voice of Jason Bateman), to solve the mystery. The supporting voice cast includes Shakira, Idris Elba, J.K. Simmons, Nate Torrence, Jenny Slate, Tommy Chong, Octavia Spencer, Bonnie Hunt, Don Lake, Alan Tudyk, Tommy Lister, Katie Lowes, Jesse Corti and John Di Maggio. It was also announced last week that Michael Giacchino will provide the score, his first collaboration with Walt Disney Animation Studios. The studio will also release another animated adventure next year, Moana, arriving in theaters one year from today, starring Dwayne Johnson. Zootopia is directed by Byron Howard (Tangled, Bolt) and Rich Moore (Wreck-It Ralph, The Simpsons), and co-directed by Jared Bush (Penn Zero: Part-Time Hero). The screenplay was written by Jared Bush and Phil Johnston (The Brothers Grimsby), with Clark Spencer (Wreck-It Ralph, Lilo & Stitch) serving as producer. The studio has set Zootopia for release on March 4, 2016, putting it up against London Has Fallen, Me Before You, Desierto and the Untitled Tina Fey - Margot Robbie - Martin Freeman Project. In addition to the trailer, we also have two new photos featuring Judy Hopps, Nick Wilde, and the "fast" sloth known as Flash. 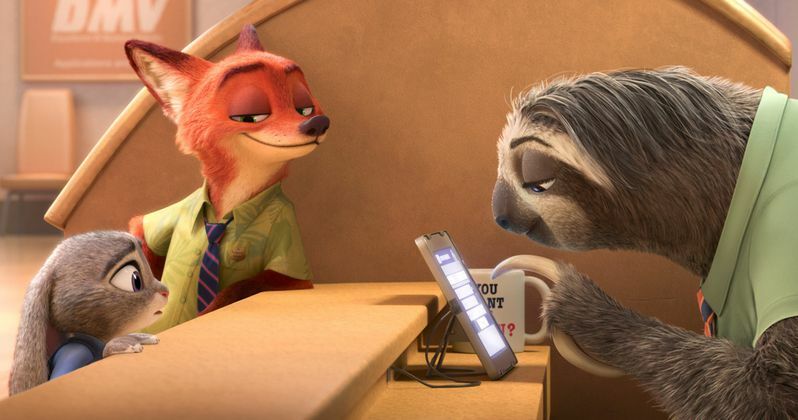 While we wait for more details on Zootopia, take a look at the trailer and photos below. Do you think Zootopia could be an animated blockbuster when it hits theaters next spring? While it certainly will have plenty of competition to face next March, this could be the latest blockbuster from Walt Disney Animation Studios, but we'll have to wait and see.